Do you see babies and children? Absolutely, Dr. Jon specializes in pregnancy and pediatrics and is trained through the International Chiropractic Pediatric Association (ICPA). Is an adjustment for an infant or child the same as for an adult? Not necessarily, Dr. Jon uses very gentle and specific adjusting techniques for all patients appropriate to their age and size. For infants, the amount of forced used is no more than that used to check the ripeness of a tomato. For children, depending on their age and size, Dr. Jon may use light manual techniques or a gentle and specific adjusting tool called an Activator. Do you see pregnant women? Absolutely, Dr. Jon specializes in pregnancy and pediatrics and is trained and certified in the Webster technique which is specifically designed to help pregnant moms throughout all stages of their pregnancy. Are you open on the weekends? We do not currently have weekend appointments available. In order to provide each patient with plenty of time for their visit we require appointments to be scheduled. 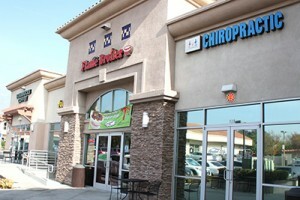 We are located on the northwest corner of 19th St. and Carnelian in Rancho Cucamonga, three doors down from Starbucks, just south of the 210 Freeway. We accept most insurance, however since there are so many different plans and coverage varies widely we first must verify your benefits before any insurance is utilized. To do this, we will take a copy of your insurance card on your 1st visit, send it to our billing department for verification, and receive a report of what chiropractic coverage you have by your 2nd appointment. The good news is that due to the increases in insurance copays and deductibles, most of our patients find that our affordable cash plans end up saving them money in the long run, and if needed they can utilize their insurance for what it was intended for; emergency medical care. If you have additional questions, please contact us today!